Today I want to write about an amazing reptile that is found in Australia, the desert death adder. These beautiful looking snakes grow to about 70 cm long, with lovely red and orange stripes that give them excellent camouflage in the desert sand. Desert death adders are very clever hunters. They hide most of their body in the sand and dangle their tails which look like worms to attract lizards, small birds, small mammals and frogs. They wait patiently for their prey to come within range and then attack with lightning speed. They have very long fangs and are one of the most venomous snakes in the world. However, they very rarely bite people unless they believe they are in danger. Instead of laying eggs, they give birth to live babies, with up to 20 babies born at a time. 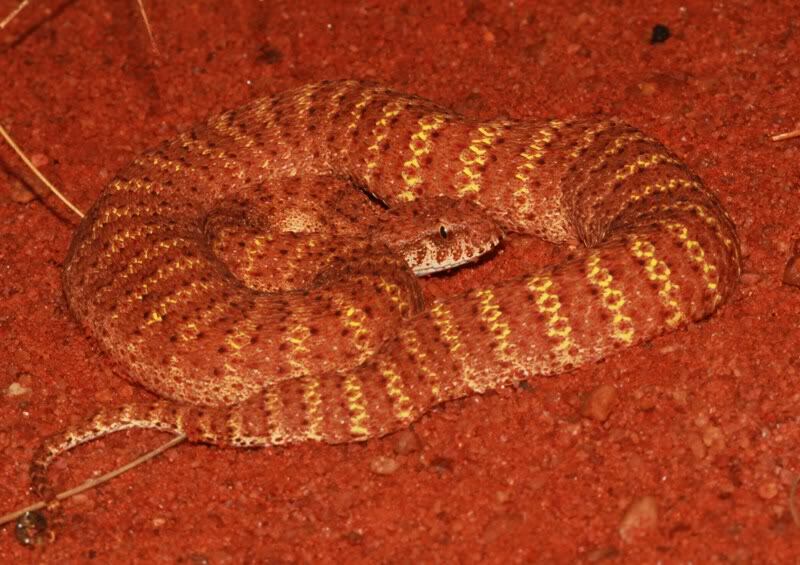 Desert death adders are found in sand dunes and rocky outcrops in very remote areas of central and western Australia. Are there any other interesting facts that you would like to share about desert death adders?